MI Films Ltd. - 91 min. Cast: Cohen Holloway, Inge Rademeyer, Jon Pheloung, Richard Thompson, Toa Waaka, Charles Lum, Toby Leach, Tao Jrang. An ironic look into the emotional confusion of an outlaw who reluctantly develops strong feelings for a woman he has kidnapped, while finding he is unable to "perform" when trying to have his way with her. This results in his seeking help with his problem from a doctor and medicine men, both Chinese and Native American. All the while, the pair are being pursued by a posse out to kill both of them. 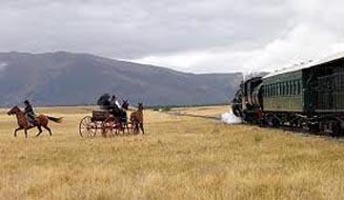 This deadpan comedy drama was filmed at various central Otago locations, MacKenzie Country locations, the Southland location of the Kingston Flyer steam train plus the central North Island western town of Mellonsfolly. High production values, wonderful photography and a memorable original soundtrack combined with a minimalist script and action that is sometimes over the top to the extent that twice I found myself laughing uncontrollably with this atypical western. Highly Recommended. As of April 2012 - An R1 NTSC DVD is available from North American sources, usually selling for around $20us. It is presented 2.35:1 with a DD 5.1 English soundtrack. Extras include two front-loaded unrelated trailers, a "Making of" featurette (17 min.) and an audio commentary track which sounds as though it was recorded in a room without acoustic tile. There are, unfortunately, no subtitles. As of 21 November 2012, a New Zealand R4 DVD release includes the "making of" featurette and audio commentary track, selling for about $30nz. Interactive Locations Map of key filming locations used in New Zealand as a stand-in for the American West. The Making of Good for Nothing featurette and a Blooper Reel. Two audio commentary tracks with director & lead actors or director and composer. ED: My recommendation is the Special Edition DVD offering. Although there is a Blu-ray, technically the BD is fine but not exceptional and the SE DVD extras are worth having, especially if English is not your first language. As of 20 October 2015, an ALL Regions Blu-ray became available for about $15us. It is 1080p with DD 5.1 surround or DD 2.0 Stereo. It also has optional English subtitles. There are no extras. 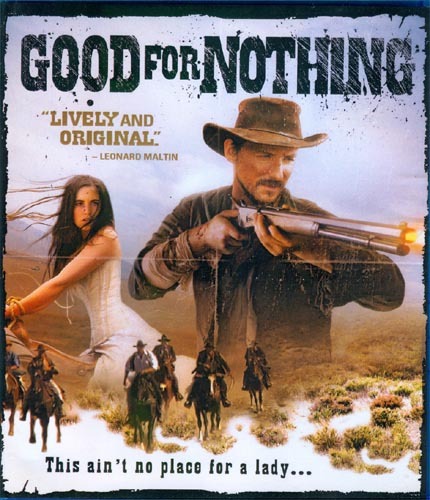 'Good For Nothing Store' - HD download purchase with 19 subtitle options.